 The Wheely Bug riding toy helps babies and toddlers develop their bodies.  Babies move side to side or back and forth.  Available as ladybug, cow or bee. 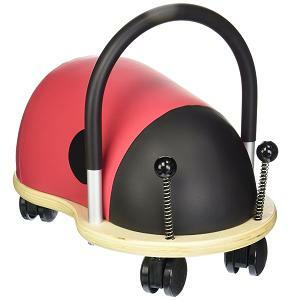 The Wheely Bug riding toy is a great toy specifically designed for smaller toddlers. It helps toddlers move and develop their bodies. What's special about this riding toy is that it allows babies and smaller toddlers to move back and forth, side to side or any which way thanks to the toy's swivel wheels. Most toddlers really love this ride on toy! It is available in ladybug, cow or bee patterns. Just make sure that you choose the small size bug.